A hemopoietic cytokine. Stimulates erythropoiesis, acts on mitosis and differentiation of erythropoiesis progenitor cells. 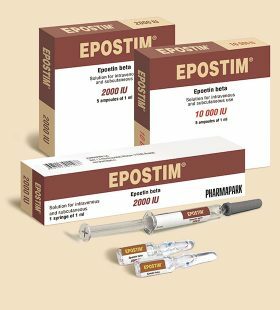 Epostim is used for treating and preventing nephrogenic anemia in patients with chronic renal failure on or before peritoneal dialysis or hemodialysis, for treating anemia in premature newborns, for preventing anemia as part of preparation to surgery with expected massive blood loss, for treating anemia in cancer patients. Solution for intravenous and subcutaneous administration, 1000 IU, 2000 IU, 4000 IU, 5000 IU or 10 000 IU 1 mL in ampoules; 2000 IU or 10 000 IU 1 mL in prefilled syringes. Recombinant human erythropoietin, human albumin (human albumin, sodium caprylate, acetyltryptophane), sodium citrate dehydrate, sodium chloride, citric acid, water for injection.